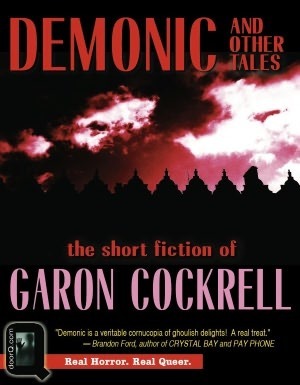 Garon Cockrell is a new writer who recently published a book of short horror stories, a copy of which I got a few days ago to read. The stories boast a broad range of subects, from deals with the Devil to killer clowns to psychotic breakdowns. There is one specific thread running through the stories involving demons and the dark side of Christianity (watch out for Lilith!). I like the idea of interconnected stories and almost would have liked to see this appear in all of the stories to create an overarching plotline, but it still works well to connect a few of the stories. Cockrell is not short on creative ideas. Many of his premises are surprisingly fresh, like the elderly woman who begins to hear the eggs in the supermarket screaming out to her to save them. When they get cracked open, what lies within is none other than a beating heart. I also love a good killer clown story, so there’s that. Unfortunately, the execution didn’t quite live up to the ideas themselves. I found it hard to empathize with the characters, and since that is a major factor of psychological suspense, most of the horror factor relied on gore and shocks. If you’re into that, then you might enjoy these stories a little more. While I wanted to enjoy the creative stories for what they were, the juvenile writing sometimes got in the way. With a good editor and some revising, I think these stories could be a lot better, but as it is, they could do with a grammer check. For instance, the point of view skips around between characters (which I always have a problem with and many writers inadvertently do), and there are some tense issues in one of the stories. “The Strange Tale of Griffin Shard” is intriguing and pretty cool. I enjoyed this one for the most part, but be warned that the “shocker” at the end is a lot like The Skeleton Key (which, for the record, I think is a good movie). Most of the stories have shock endings, which I found got a bit stale after a while. There’s also a story with an interesting setup involving a boy who goes bonkers and starts gutting a frog before killing his parents, but this one devolves into a Friday the 13th style serial killer shlock-fest with a bunch of teenagers at a lake. By all means, you could do way worse when picking up a self-published or small Indie press title (especially for small price of $2.99). If you’re looking to enjoy some creative ideas and aren’t too bothered by a lackluster writing style, then you can find yourself a cheap digital copy of this here. UPDATE: Garon told me that some of the issues I pointed out here are being worked on and will be fixed for the book’s re-release! So definitely check it out when this round of editing is done! It should be available in a couple of weeks. NOTE: If you wrote a book, short story, or novella that you would like me to review on Pandora’s Pen, query me through my Contact form and I’ll get back to you ASAP. I may not always have time, but if I do I would be happy to read and review your published* work. My goals are to 1) help you get more visibility and readership, and 2) help you improve your writing. While you might not like my review, I will always be honest and well-intentioned.